Take four of the plastic cups and punch one hole in each, about 1/2 inch (1.5 cm) below the rim. Take the fifth cup and punch two holes in it, directly opposite from each other, about 1/2 inch (1.5 cm) below the rim. Now punch two more holes in the cup, each 1/4 inch (1 cm) below the rim that are equally-spaced between the first two holes. Using the push-pin and the scissors, make a hole in the center of the bottom of the cup with four holes in it. The hole should be large enough that the pencil can fit easily through it. Slide one of the straws through the hole in one of the cups that has only one hole in it. Bend the end of the straw that is inside the cup about 1/2 inches (1.5 cm) and tape it to the inside of the cup. Place the other end of the straw through two of the holes in the fifth cup and then trough the hole in one of the other cups. Tape the end of the straw to the inside of the cup as you did earlier, making sure that the openings of the two cups face opposite directions. Repeat steps 4 and 5 with the remaining two cups, sliding the straw through the remaining two holes in the fifth cup. Make sure that the opening of each cup faces the bottom of the cup next to it (in other words, no two openings should be facing each other). Each of the four cups should be facing sideways. Insert the pencil with the eraser facing up through the bottom of the fifth cup. Carefully push the pin through the two straws and into the eraser on the pencil. Take the permanent magic marker and draw a large X on the bottom of one of the cups. 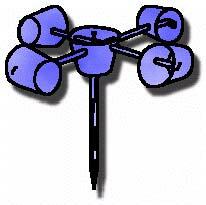 Your anemometer is now ready to use! Take it outside and hold it in front of you in an open area where the wind is blowing. Look at the X on the bottom of the cup as it spins around. Count the number of times it spins around (revolutions) in 10 seconds. Use the table below to estimate the wind speed.